The 1950s were the golden age of radio drama. Now you can relive 3 classic mysteries live on stage. 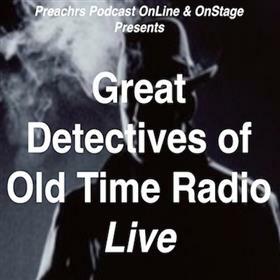 Be immersed as this show recreates before your very eyes the experience of attending a 1950s radio drama recording, with scripts from old favourites Candy Matson and Yours Truly Johnny Dollar! Join us for a night of mystery, comedy and intrigue! Candy Matson was always finding herself in tricky situations and regularly assisted the police in their investigations. Being one of the only female investigators of the time it’s no wonder why her show was one of the most popular radio shows of the time. Featuring comedy, intrigue and drama, Candy Matson is one of old time radio’s most beloved characters. Yours Truly Johnny Dollar was one of the longest running radio shows of the era and it’s all based around the “action packed expense account of Johnny Dollar private insurance investigator!” Johnny Dollar is always getting tangled in sticky situations and he often has to improvise his way out of threatening scenarios! Yours Truly Johnny Dollar is a comedic, light hearted, thrilling show - featuring a detective who’s always on the case! This production features a phenomenal cast of Australian actors including, Benjamin Maio Mackay, Eden Trebilco, Julia Sciacca, and Jennifer Barry. Prepare to be taken back to the 1950s in this entertaining, comedic and intriguing piece of theatre! Featuring special guest stars: The Chaser's Andrew Hansen, The Feed's Mark Humphries, Dirty Dancing's Kurt Phelan and Jersey Boy's Stephen Mahy.